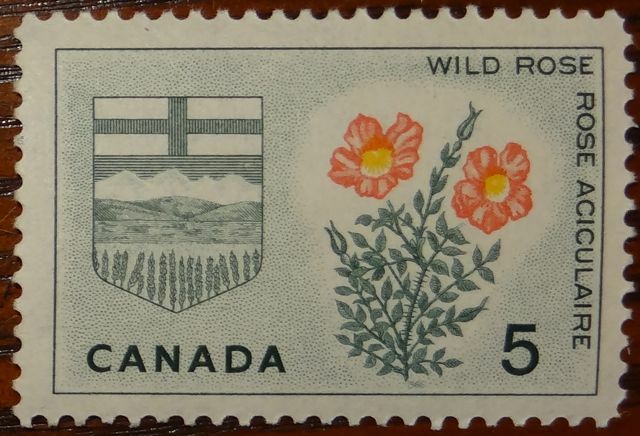 Anyway, in honour, here is the Alberta provincial flower from a 1966 stamp. It was engraved by Allan Carswell and designed by Harvey Prosser as part of the floral emblem series from 1964-66. 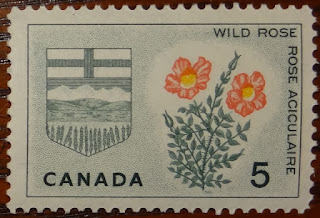 The wild rose is the most abundant rose growing in the boreal forests of northern Canada. When faced with our climate, wild roses are typically more hardy, pest-resistant and beneficial to wildlife than the classic cultivated roses. The shoots, fruit, flowers and leaves are all eaten by humans and animals. The roots can be made into an ointment for the eyes, and arrows have been made from the wood When the Wild Rose is in bloom, its fragrance attracts bees and other insects to gather and distribute the pollen. As the flower begins to wither, it turns into a small oval shaped hard seed container called a "rose hip" which is also considered the fruit of the plant. The pink flowers bloom from late May to July. Unbelievable devastation from that fire. Great stamp, I like how the design highlights the flower in color. We have been watching the devastation at Fort McMurray in horror. Thanks for the tribute. Terrible watching the news from Fort McMurray. Pretty stamp, and a nice idea to use it. So sad and bad, those fires. Nice stamp, and so good to show this one as a tribute.